The snow scene was taken at 8.30am on New Years Day in 1962, by Gordon Gangloff, which Dinnages Publishing created as a first Christmas Greeting card about the time of number twelve postcard in that series. 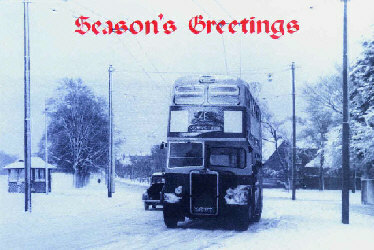 We were only given a licence to use this image in this form of a greetings card, sorry but it is NOT available from us a photograph. The photographer allowed us to create these with sufficient for his own use on that year of 1999 as his Christmas Card. Once stock is sold, this card will never be reissued. Future designs may be of a bigger size. The card doubles as a genuine 6×4 postcard with a proper split informative reverse to the card frontage image. You can buy a pack of five of these cards with envelopes only direct from the publisher here in this secure shop or here. This view was used for this card in an agreement between the original photographer Gordon M Gangloff and Gordon Dinnage, dated 23rd August 1999. Requests since for prints in other formats have been declined as our agreement was just for the image to be used as a Greetings Card. Please respect the copyright owners and take account that once the quantity of existing greeting card packs have been sold the image will be no longer available from us. All monies sent for 6×4 prints and similar without the greeting overprint will be declined. Copyright ownership of this view is still with the photographer, even if subsequently the negative has been given or sold to another person or organisation, and that he has since passed on, the use of this view was agreed with the copyright owner and is NOT an infringement of any possible new owner of any negative as Copyright remains with the photographer, with this agreement already in place prior to any later aquisition of the negative.